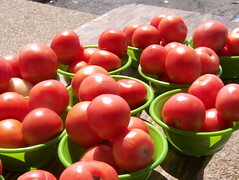 The market up at Timberlane doesn’t look like much, if you’re accustomed to “farmer’s markets” with masseurs and string quartets — folding tables and veggies, no oompah bands — but at least a handful of farmers are there year-round. It takes some dedication to go to the farmer’s market in the blustery months, when you’re lucky to score garlic greens and maybe some resilient spinach, but as the photo shows, we’re getting into the easy season, when it’s a joy to fill shopping bags with sun-drenched ‘maters, fancy lettuces, eggplant, peppers, green beans, Manatee Farm’s wonderful oyster mushrooms, and wickedly sweet strawberries. I’m not all about the veggies, however, and two weekends running I’ve scored fabulous local fish. 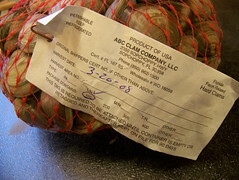 Last weekend it was clams from ABC Clam Company in Sopchoppy. I rested the clams in cold water for four hours so the clams would spit out whatever it was they had brought from the sea, then steamed them with a little white wine and butter and whisked them to the table with crusty brown bread. I also bought some tupelo honey from the fisherman, and asked him if he had produced it. “No, I used to, but it’s too hard,” he replied. “Now I let the bees make it.” It was Easter weekend and I was splurging, so I made tupelo ice cream–just vanilla custard ice cream with tupelo honey instead of sugar. It was satin-smooth, and tasted of sunlight and spring afternoons. At the urging of a work colleague this Sunday I went to Mike’s, an Asian food and fish store. In the past I have been underwhelmed — it seemed weary, and smelled of old fish — but something has indeed happened at Mike’s: it was bright and tidy, with only a faint, clean aquatic fragrance to tip me off that the fish counter was still there in the back of the store. A knowledgeable young fishmonger pointed Yessum toward the grouper cheeks. (“Yessum” is who I am in many Southern establishments, as in, “Yessum, those grouper cheeks are right fresh.”) Grouper is a moderately-flavored local fish, and its cheeks are sweet delectables that bake up moist and firm; at $6.99 a pound, grouper cheeks are an insanely good deal. Mr. Fish apologized for the shortage of other fish — apparently there was a run in the store the previous day, and their fish is the real McCoy, pulled in from our Gulf waters — but there was no need; I was a happy cook. I baked the grouper in a drizzle of olive oil, sea salt, and fresh-ground pepper, and served it over a mound of eggplant sauteed with Vidalia greens, garlic, peppers, and oyster mushrooms, accompanied with whole-wheat couscous perked up with organic parsley for color and bite. I still eat meat now and then, but the more I learn about factory farming, the less interested I am in commodity meat — and the more I paddle toward local, sustainably-caught fish. With Southern Seafood anchoring the northern end of town and Mike’s for those of us in these parts, and rumor having it that New Leaf, when it finishes expansion, will have a fish counter, plus fine establishments such as the Shell Oyster Bar to keep us in mollusks, there’s no shortage of oceanic protein to keep us Dixievore pescetarians happy and well-fed. This was written by K.G. Schneider. Posted on Tuesday, April 1, 2008, at 5:15 am. Filed under Tallahassee Dining, Tallahassee Living. Bookmark the permalink. Follow comments here with the RSS feed. Both comments and trackbacks are currently closed. Oh, you southern locavores are so much luckier than we Yanks! Our farmer’s market won’t even start up for a few more weeks, and it will even be another week or two before we are able to forage ramps and morels! Sarah, who wishes she lived nearby and could invite herself to dinner — you sound like a wonderful cook! My only complaint about the market is that Farmer Herman is usually sold out by the time I get there. Dave, that is great! what a terrific podcast series! Yes, I slept in Saturday, since I’d flown in late the night before (and whew were my arms tired…). By the time I got there, I had missed Farmer Herman and Miss Louise entirely! On the plus side, I do get pretty decent fresh veggies year round, even from the local farms. This is me, testing the comment feature, and also noting that I saw grouper cheeks at Southern Seafood last weekend.